This section focuses on placing hierarchical components and navigating between schematic levels. 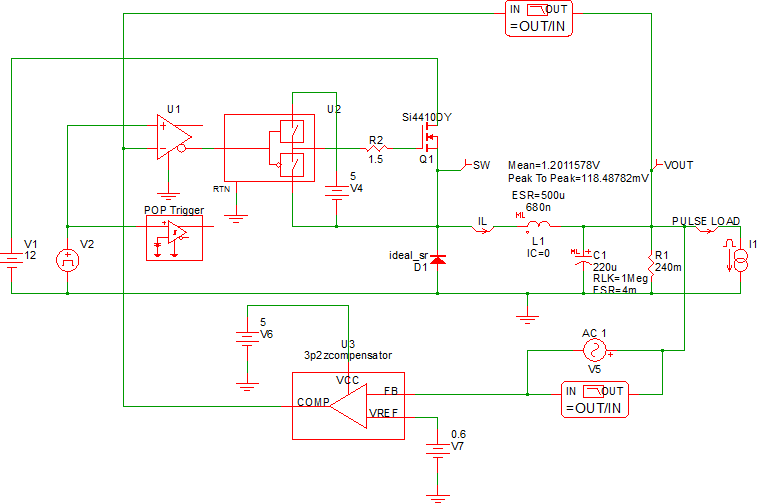 Schematic components can be placed with either the full path or with a path relative to the parent schematic. 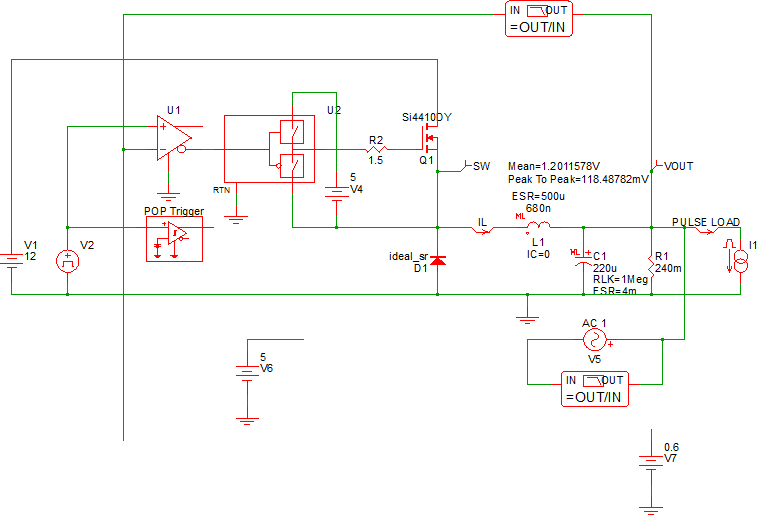 Schematic designs using relative path symbols are portable and can be easily shared with colleagues. The keyboard shortcut Ctrl+E allows you to descent into child components; Ctrl+U takes you back up to the parent level. How to place the symbols contained in schematic component files. How to navigate between hierarchical schematics. In this section you will start with the schematic from the end of section 5.2 Set up a Load Transient Simulation and place the schematic component symbol created in 5.3 Creating Hierarchical Schematics. 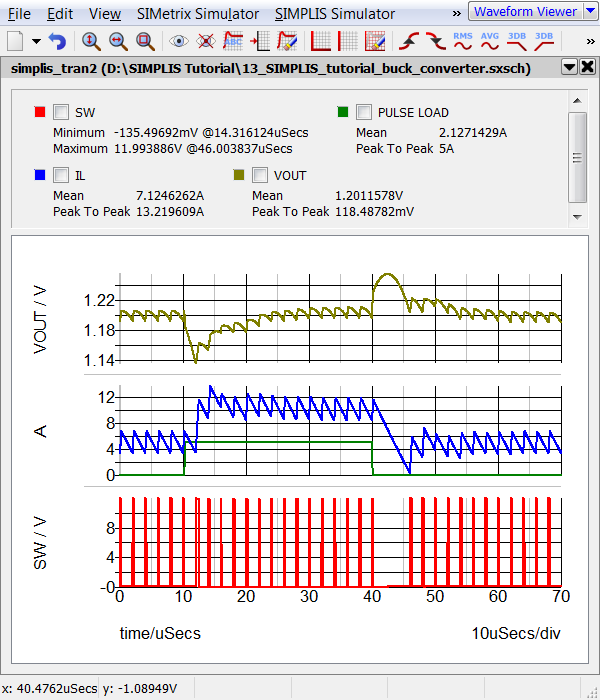 Open the schematic you saved at the end of section 5.2 Set up a Load Transient Simulation or use 12_SIMPLIS_tutorial_buck_converter.sxsch from simplis_tutorial_examples.zip. Delete the compensator symbols you moved into the 3p2zcompensator hierarchical block in section 5.3 Creating Hierarchical Schematics. From the menu bar, select Hierarchy > Place Component (Relative Path)... .
Open the Modeling Blocks folder. Select the 3p2zcompensator.sxcmp schematic component, and click Open. 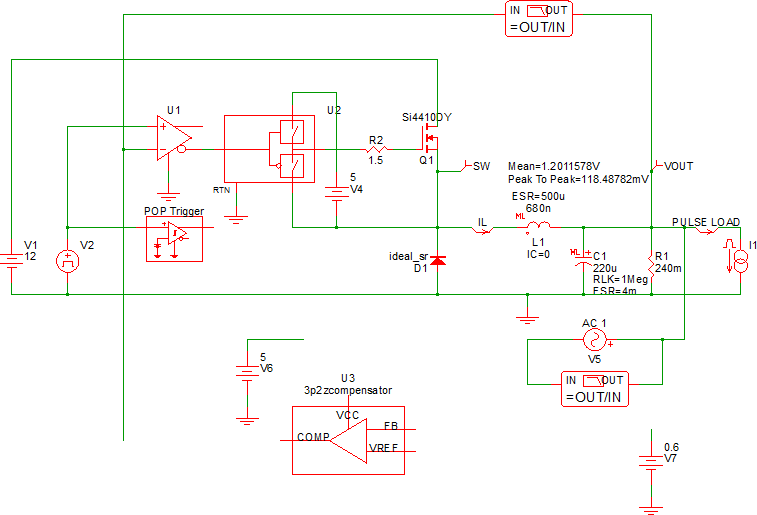 Note: A schematic saved at this state can be downloaded here: 13_SIMPLIS_tutorial_buck_converter.sxsch. When you save a schematic to a new name or save a schematic to a schematic component, the content of the F11 window is also copied to the new file. Normally, this is not a problem, but in this case, the compensator has unused analysis directives and the parent schematic has compensator calculations which are not used. While this extra text does not cause a simulation issue, the extra text might confuse a colleague who is unfamiliar with the design. Press F11 to open the command window. In the command window, scroll down past the .SIMULATOR DEFAULT line and select all text below that line. Press Delete to remove the text. Note: You can undo editing in the F11 window with the keyboard shortcut Ctrl+Z, or by selecting the menu Edit > Undo . Press Ctrl+S to save your schematic. You need to descend into the schematic for the compensator and clean up the F11 window, using Ctrl+E to descend the hierarchy and Ctrl+U to ascend to the parent level. Select U3, the 3p2zcompensator schematic symbol. Press Ctrl+E to descend into the schematic. Result: The schematic for the 3p2zcompensator opens just as if you opened it from a file browser. Result: Since the compensator schematic is open, you are viewing the F11 window for the compensator component. Select the analysis directives from the first line, .SIMULATOR SIMPLIS, to the .SIMULATOR DEFAULT line. *** it sets the magnitude of other compensator values. Press Ctrl+S to save the compensator schematic. You are now ready to simulate the design. When you are working with a hierarchical design, you can simulate the design from any level of the hierarchy. To simulate this design, press F9. The schematic at this point is a complete hierarchical design. Although only one hierarchical block is used, the concepts in this chapter can be used to create larger and more complex hierarchical models. Be used in other controllers which need a 3-pole/2-zero compensator. Replaced with a different compensator, using an alternative control approach. The symbol used in the hierarchical block can be saved to another compensator block, allowing drop-in replacement of the compensator block on the parent schematic. Parameterized with the values defined in the parent schematic. For example, the poles and zeros could be passed into the compensator from the synchronous buck converter schematic. Parameterization is described in the Module 5 - Parameterization topic.